The project proceeds in four phases over a six-week field season each summer and consists of: (1) a week-long cultural study in Ireland in partnership with the National University of Ireland, (2) a field module of practical instruction in the methods and theory of archaeological excavation, (3) laboratory processing and preliminary analyses of artifacts collected during the excavation, and (4) continued student investigations of Irish America through independent research projects during subsequent academic years. Phase One (approx. June 24-July 1) ~ This feature of the project has been suspended due to funding constraints, but will be resumed when financial support allows. 2) The historical contexts for emigration from Ireland as well as their consequences. Emigration was shaped by a variety of political, social, economic, religious, and other factors, which varied both through time and across space. Students develop an appreciation for temporal and regional variations. One consequence of the colonial experience in Ireland is that Irish American experiences tend to be homogenized. The stereotype of the impoverished slum-dwelling immigrant tends to dominate understandings of Irish experiences in the U.S., but the reality of Irish immigrants was much more varied, diverse, and dynamic.The cultural study and supplementary readings explicate a variety of aspects of Irish life, including céilí dancing, sean-nós storytelling, religion, political history, agricultural lifeways, and the like. Students come away from the week-long excursion understanding the complexities of emigrant experiences. The second phase of the project consists of three weeks of archaeological excavation at a series of nineteenth- and early twentieth-century homesteads on Beaver Island associated with Irish immigrants in partnership with the Beaver Island Historical Society. Readings for the field module explicate the history of the site and region, frame the theoretical position for our study, and provide comparative examples in historical archaeology. The main learning goal for the field portion of the project is for students to master proper excavation methods and techniques. In addition, the general public is invited to visit the excavation during Museum Week on the island (the third week of July). 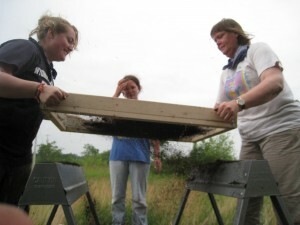 In the future, members of the Beaver Island Historical Society and the general public may be invited to volunteer on the excavation or in the lab under the supervision of trained student unit coordinators (planning for this is still on-going). Concurrently with the field excavation, we collect oral histories from local residents about their Irish ancestors. One advanced-level undergraduate student assistant oversees daily oral history activities. Students enrolled in the field course each spend at least one full day assisting with the process in order to learn the methods and techniques of collecting oral history as well as develop an understanding of oral history as a data set for interpreting Irish immigrant experiences on the island. Oral histories are one important way in which members of the general public can contribute to this project. Students are also be assigned a series of readings on oral history and oral tradition, which are specifically relevant to the Irish diaspora. We advertise broadly through local media outlets, postings in prominent public places on the island, and through the Beaver Island Historical Society newsletter in order to capture as many participants from the general public as possible. The project also includes laboratory processing and preliminary analyses of the artifacts recovered during the excavation. The laboratory module runs both concurrently with the field excavation as well as occurs during two dedicated weeks at the end of the field season. The readings for this module explore analyses of different artifact classes, laboratory procedures, and interpreting the past through material culture. The primary outcomes of the laboratory component are for students to attain basic proficiency in laboratory methods and protocols, identification of main artifact types, and begin to develop an understanding of how to proceed from a pile of broken dishes to an interpretation of the past. Throughout the field season, students are required to select a subset of the project to investigate more deeply. For instance, students might seek to answer a particular question about gendered divisions of labor or consumer choices or the roles of children at a site. Students each develop and publish a web page that discusses their chosen research question, the data they used to answer it, and their preliminary research results. They also make an oral report to their peers at the end of the field season. In addition, students are encouraged to continue with their research during the subsequent academic year. Past products of student work have included senior theses, papers and posters presented at conferences, museum displays developed for the local public library, and co-authored publications. 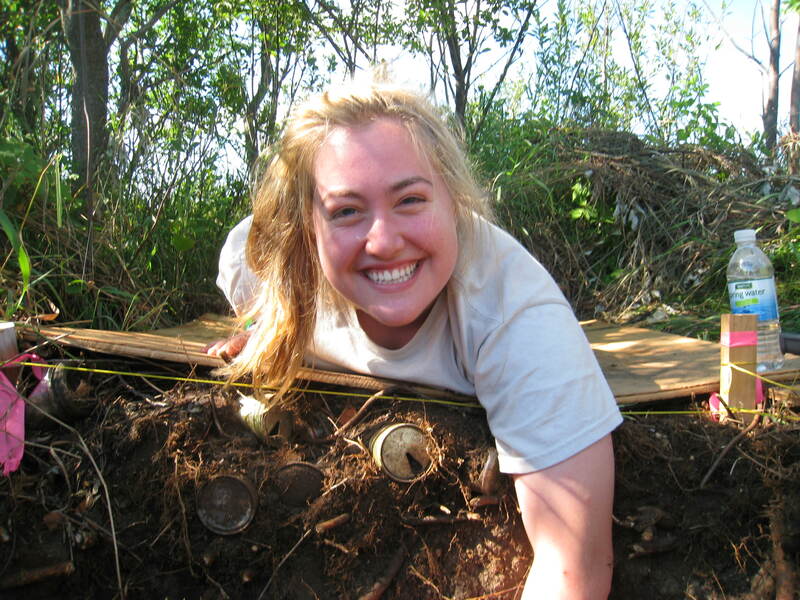 These professional development activities give students real world experience in archaeological inquiry and help make them compelling candidates for graduate school or post-baccalaureate employment. 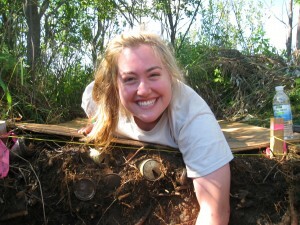 Project Funding: This project has thus far received financial support from the Institute for Scholarship in the Liberal Arts to support the week-long cultural study in Ireland and from the Keough-Naughton Institute for Irish Studies for student room and board on Beaver Island (2010-2012). The Charlevoix County Community Foundation has supported the public education and outreach portions of the project (2010), including guest lecturers and the participation of Beaver Island Community School teachers in the Project Archaeology workshop. Additionally, Fr. Tim Scully and the Scully Family have provided unrestricted funds for other project needs (2010-2012). Financial support for student research assistance and other project expenses has been granted by the Office of Research at the University of Notre Dame (2011). Grant applications for future field seasons are currently in preparation and under review.